Food was ok...service left much to be desired. Better training would probably help. Had the She Crab Soup (just ok) and Pasta Carbonara (way too many red onions). My bf had a salad and loved the freshly made blue cheese dressing. He also had the gumbo which had ok flavor but LOTS of okra. The restaurant is in a strip mall and tasted like its location...not the best. Lou Lou Food and drink never disappoints -- consistent friendly service and excellent food. That's why I've been coming here for probably 20 years! We both had the small wedge salads, which were a really nice size and very tasty (fresh crisp lettuce, blue cheese dressing, tomatoes and bacon). I had the 10" Lou Lou pizza, which I love so much I have a hard time ordering anything else! It was great, and it was nice to reheat 1/2 of it the next day for lunch! My husband had the 10" BBQ Chicken pizza. He kept saying he was going to take 1/2 home..........but it was just too good and he kept eating. 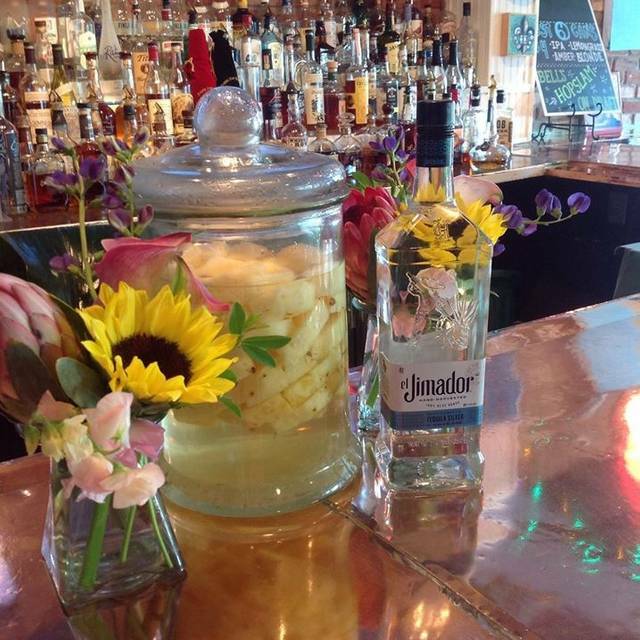 :) Thanks Lou Lou Food and Drink -- you helped us kick of the weekend on a high note (again)! Outstanding food and service! Try the bread pudding! For years, great food, service, fascinating food combos. Always hsppy to be there. Food was delicious and service was excellent. Will definitely be back! The food was great! The server recognized we were having a meeting and gave us plenty of space but was still very attentive. Definitely will return. Food was amazing. 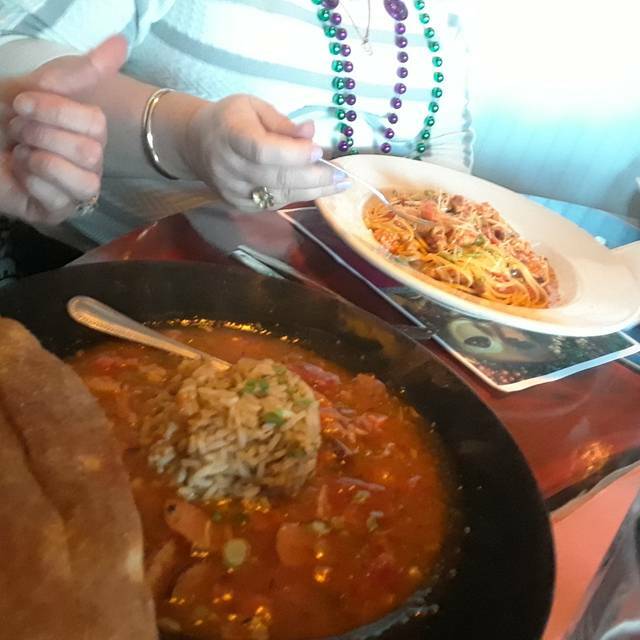 We ordered from the bayou portion because it was Fat Tuesday and loved it all! Highly recommend making a reservation. Our server was polite and attentive even though it was extremely busy. Great time had by all at their Mardi Gras party. The band was absolutely awesome. Food was delicious and promptly served. Our waiter kept us filled with drinks without having to ask. We were there for Fat Tuesday Mardi Gras celebration. We had a great time. Food and service was great even though the place was packed for the celebration. Our first time there and we thoroughly enjoyed it. I am anxious to go back and try there regular daily menu. This is our favorite restaurant and go-to place! Amazing food and always great service. I would recommend based on previous visits, but this was pretty bad. I was there with my daughters and ordered two kids spaghettis and lasagna for myself. The spaghetti was very bland and the middle of my lasagna was cold. The restaurant wasn't that busy for a Saturday night, but our server wasn't very responsive and it appeared that he couldn't care less about our table. Good experiences previously, but this was bad. Great service. Reserved table all set for us. Always enough food for two meals! Great vegetarian options as well. It was good. Neighborhood feel. Great food but had to wait for clean glasses before 2 in our party received their drinks (10-15 minutes) and they ended up bringing drinks in plastic cups which is fine but should have been offered sooner. For another in our party, they got the order completely wrong and had to remake. He got his food after the rest of us had finished. Waited a while for refills but to the servers credit, it was very busy and food was really good. We will go back for sure, but there are things that could be improved. Should have probably offered a discount to the guy who received the wrong food and had to wait 15-20 minutes for his dish. Group of 8 family members. Everyone’s food was terrific. I had the pan grilled salmon with mango jalapeño salsa and asparagus. Excellent presentation. and VERY tasty- i would highly recommend it. Others tried: shrimp and grits, hot brown, pizza, gumbo, calzone. All were happy with the service, food temperature and portions. We were passing through town on our way to Nashville for our anniversary celebration and decided to stop here for dinner en route. I found this restaurant through the OpenTable app, and the ratings and reviews were very high. We tried several items: 4 different appetizers to start off, and we each ordered a different entree. The service was top notch. We had a wonderful experience and will definitely be back to LouLou’s!!! I really enjoyed a nice evening here, the service was wonderful and the food was perfect! We had a wonderful dinner. The chicken pasta was great. The pizza was delicious The tomato basil soup was wonderful. The bread pudding is fabulous and is the best in town! I was disappointed to receive an email from open table saying we were a no-show! This is my second time visiting the restaurant. On both visits, the food was just OK. 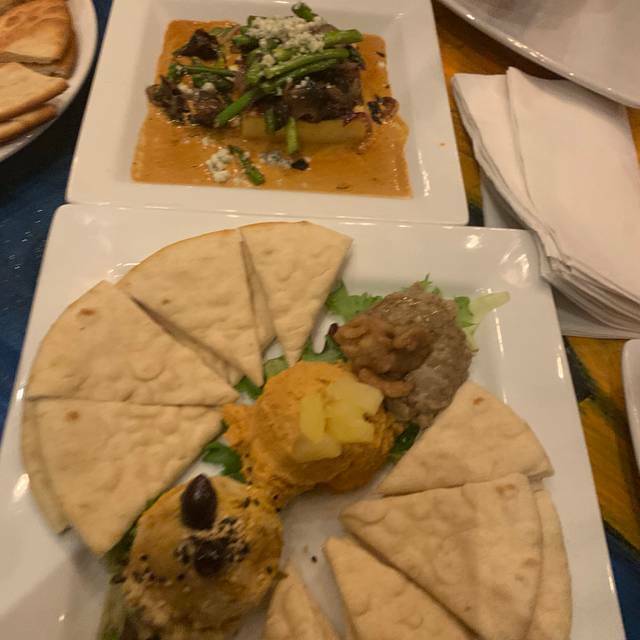 I did enjoy the hummus appetizer. Great waiter service but management should monitor seating arrangements to not appear biased. This was our first visit to Lou Lou, but we will certainly go back. Service was great. We appreciated the fact that it wasn't too loud - we could easily carry on a conversation. The hamburger was great, and the hot brown was tasty, although I thought the mornay sauce was not traditional. Seemed more like pizza cheese to me. We really enjoyed our visit! Service was fantastic. Noise level was loud enough to not be awkward but still have intimate conversation. Great for a date night! My wife and I were with another couple for a night out after church and chose Lou Lou. 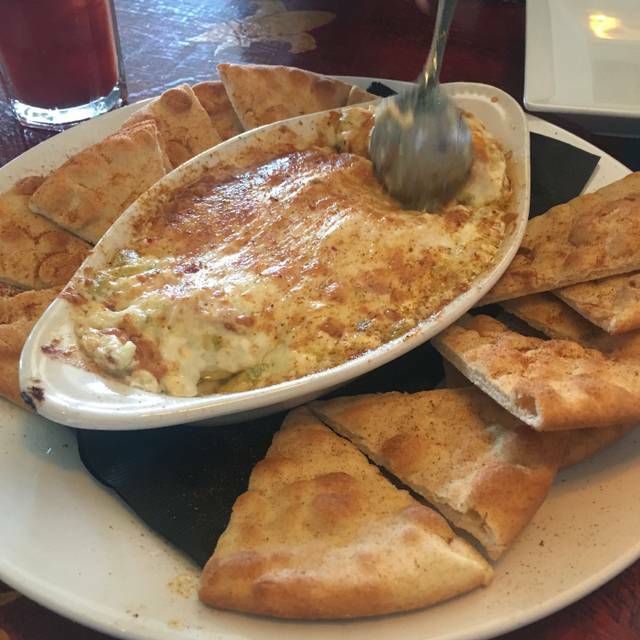 Having been there several times before, I expected good food and service and that’s exactly what we got! The Cajun twist of this restaurant is what makes it so special. One of my Louisville favorites! I always recommend Cafee LouLou to my out of town guests. Great 👍 Neighborhood Bar & Cafe! 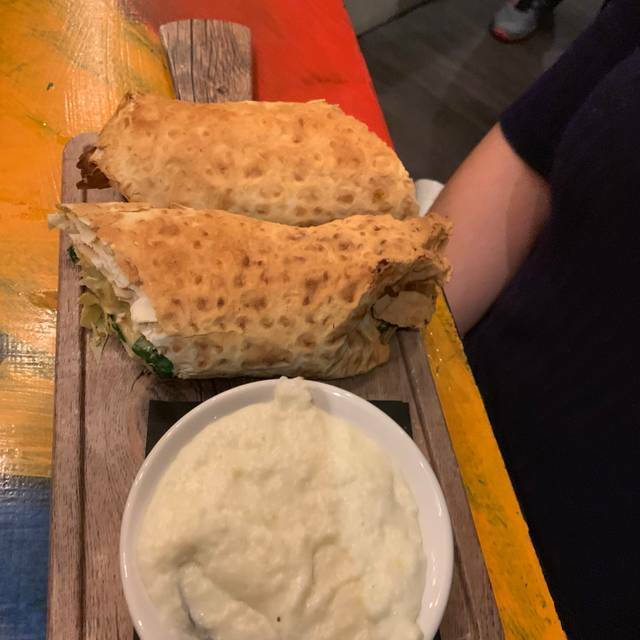 Lots of laughter, personalized service, great food from a nice selection of fresh made salads, to pasta dishes & calzones, & of cross their mild but very good creole dishes! I was able to get work done in their bar area, they had fantastic wi-fi & large enough high-tops to spread out! Too noisy. Get some soft surfaces or baffles. Db’s were over 70 avg. Loves all of it! Great service. And it was busy, but you would have never known! 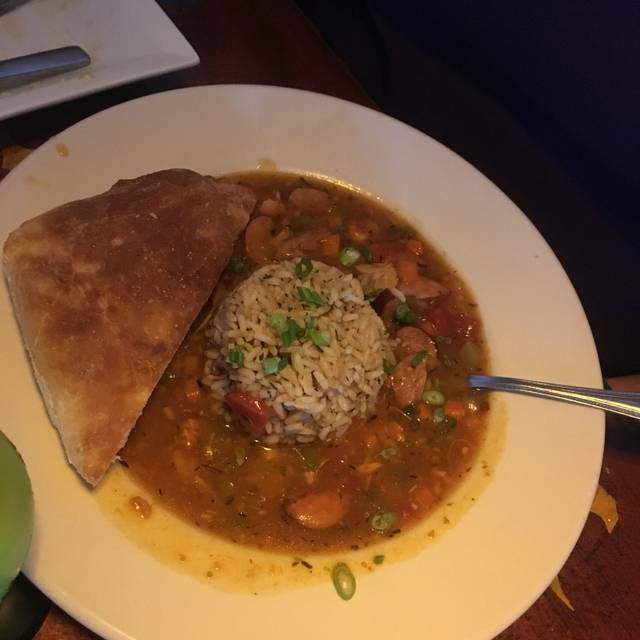 I was disappointed in the gumbo, so much rice! My partner was underwhelmed by the oysters. As always, the brownie is one of my favorite desserts in town. It was a cold night so wasn't crowded. Service was excellent from the bartender. We can always count on Lou Lou!! We had a nice night out - trying to beat the bad weather. My husband had the wedge salad, which he raved about and the meatball sandwich. He took half the sandwich home and had it for lunch the next day -- he loved it and said the aoli was a really nice flavor! I had the small Greek salad which was very flavorful and the pasta carbonara which was fantastic! Our server did a great job - friendly and the right amount of attentive. I have so many memories of meals, celebrations, good times with family and friends at Lou Lou -- I hope you keep going strong for years to come!! Cafe Lou Lou is a classic and one of our favorites. There is a menu with a variety of foods and all are great. We like that it is classic Louisville people, style, food and drinks. This was our supper clubs first experience at Lou Lou’s Food and Drink. The evening was wonderful. Everything was very very good. We will definitely be back. My husband and kids took me for my birthday! Don't expect and birthday wishes or a free dessert but the shrimp and grits r delicious!! Our experience was cut short due to a power outage in the area. Our server kept us informed and eventually suggested that we should consider leaving because they had no idea when power would be restored. Up to that time the service and drinks were very good. The food is great, pizzas, pasta, and salads are wonderful. The bread pudding is too die for. But it is awfully noisy. Not a good place for conversation.